Sometimes I set out to bake something and it just doesn’t turn out like I’m expecting. Today I made what were supposed to be frosted molasses cookie bars, but I didn’t check the size pan properly and baked them in something too small. So instead of being bars, nice and thin(ish) – it baked up like a cake. Which, would have been fine (tasted great!) except that I was planning to take the bars to a meeting tonight where I’m sure there won’t be plates and forks. I needed the treat to be portable and easily eaten. Hmmmmm. What to do, what to do. I certainly didn’t want to eat the whole thing myself, and didn’t want to make something else to take to my meeting either. (sigh) I was about to give all up for lost when I had a brilliant idea. Make cake balls out of them! Genius! So, I took that nicely spiced cake and mangled the living daylights out of it. Mixed in some icing to hold it all together, formed balls and drizzled icing on top. They taste like a little bite of my favorite iced molasses cookie. Yum! Below is the recipe for the bars. 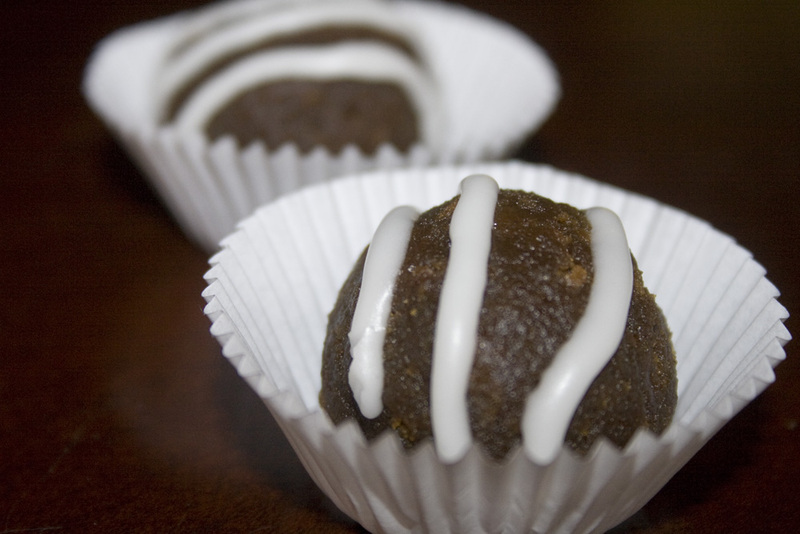 To make cake balls instead, simply bake for about 40 minutes (or until center tests done) in a 8×11 pan & allow to cool. Then mush up the cake with about a cup of the icing (recipe below – you’ll need a double batch for the cake balls) until the cake holds together in balls. Roll gently into balls, allow to chill briefly in the fridge (or your cold garage), then drizzle the remaining icing on top. Grease and flour a 13x9x2-inch baking pan. Heat oven to 350°. Sift flour with baking powder, salt, soda, and spices. Set aside. In a medium mixing bowl with electric mixer, cream butter with sugar until light; beat in egg, 1/2 cup of the molasses and 1/3 cup water. With mixer on low-speed, beat in the sifted flour mixture just until combined. Spread in prepared pan. Bake for 20 to 25 minutes, or until a wooden pick or cake tester inserted in center comes out clean. Place pan on wire rack to cool. Frost while still warm. To make frosting, combine butter, confectioners’ sugar, Beat in 2 to 3 tablespoons milk. Spread over warm bars. Cut into squares.